The Major Crimes Bureau of the Ventura County Sheriff’s Office is comprised of twenty-two skilled and talented detectives. They possess a wide variety of investigative experience and are supported by a diverse and professional civilian staff. The Major Crimes Bureau is responsible for investigating all homicides, suicides and suspicious deaths within Ventura County and our contract cities. The Bureau also investigates aggravated assaults, armed robberies, sexual assaults, kidnappings, terrorist threats and financial crimes. The types of crimes this unit investigates can be traumatic and life altering for the victim, victim’s family and loved ones. 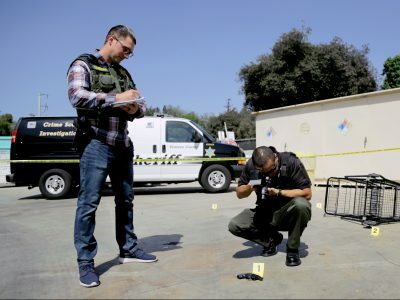 The Ventura County Major Crimes Bureau is devoted to these individuals and investigates each case thoroughly and in a timely manner to help bring closure to the people involved. The mission of the Sheriff’s Office Major Crimes Bureau is to improve the quality of life for the citizens of Ventura County by arresting and convicting the dangerous felons responsible for these heinous crimes. Focusing on violent offenders, the Bureau will use a multi-jurisdictional approach in cooperation with federal, state and local law enforcement agencies to bring investigations to a successful conclusion. Detectives will work to fulfill the mission of the Major Crimes Bureau in a way that inspires the public’s trust and confidence.